We’ve Come a Long Way Baby Boomers-Social Media Has Replaced the Water Cooler? Has social media replaced the water cooler? Some of you remember the live chats during the breaks in your work day? Many of us are working alone at our computers. When we have to ask questions we will check with an online friend or group. For example, I do Ebay, Amazon, Etsy and working on more. There are groups on Facebook, LinkedIn and others that offer support from others. For example I have a piece of “possible Jade sculpture” that I picked up at a yard sale I posted a picture of it in one of my groups for feedback before I listed it. Moments before I created this post I saw a posting on Facebook from an online friend, who I have never met in person, has had quite an influence on my blogging over the years. Her name is Beverly Mahone. She is a baby boomer who has helped to unite other baby boomer women online. Recently she shared her new book with her online friends and even had a free download. Now, you have to know that Beverly will not just promote her book but because she shares her skills she will provide information on HOW she promoted it because she is also a extraordinary journalist. She has created online communities for other women to share their expertise. When I took a break from working this morning I saw an answer from another online couple to a question I had about Pinterest. This generous couple, Wesley N Laurlee saw one of my “pins” to an Ebay listing on Facebook and instant messaged me with some tips. Now there are many other baby boomers that are “struttin” their stuff online. They are not just doing mindless gossip but sharing tips, expertise, help with caregiving plus more. We have come a long way baby boomers from that water cooler. 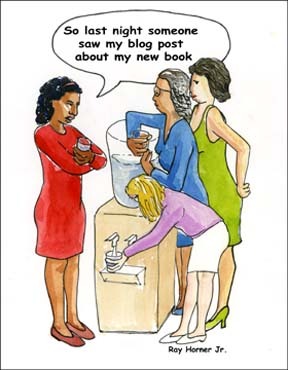 What are you doing online that you used to do around the water cooler? I miss laughing out loud with others. It’s just not the same when you put the LOL! on a post. I miss going into the bathroom to pray with a colleague and sharing SPOKEN words of encouragement. There are some things you do in person that just can’t be replaced. I hope you can update your blog and for sure, we will be happy to read it. Thanks that you shared.. I use to ask for Friday’s gig or latest party place. Now I’m already invited and ready to reply with a click. The face to face interactions were more personal and provoked an immediate response. Whether that’s such a good thing, I’m not sure. Maybe we provide better support, if we give the idea some thought. Something to think about Rita, something to think about. I’m only 31 years old and I already miss the ‘old days’ but I have to say my Grandma who is 87 is more active on Facebook and has happily picked up on Social Media more than anybody I’ve heard of her age. She is an inspiration to me; who knows what will be sprouting up as the new thing in 50 years, but I hope I accept change with an open mind like my grandmother. Kyle I am almost certain that you will have the wisdom and willingness to learn just like your wonderful Grandmother! I never really hung around the water cooler! Social media for me has been a new experience. I use it to share insights, articles, sayings, quizes with my audience. And hey, since you’re a boomer with accounts on several of the sites you mentioned above where you sell things, head on over to BoomerBazaar.com and set up an account there!